Having a full complement of water toys is expected on a modern charter yacht but, you ask, what is there to do after the sun sets? Will we be bored? Not a chance! The onboard entertainment systems found aboard charter yachts are incredibly sophisticated and diverse beyond your wildest imagination. Take movies, for example. Many yachts use server-based audio-visual systems (huge computers, really) that store hundreds of the latest movies as well as vast collections of music to satisfy every taste. These high-tech systems allow guests to enjoy different movies or music in staterooms via the flat-screen televisions and built-in audio systems, all controlled with touch-pad controls. The movie selections will usually range from pre-teen shows right up to more adult offerings, and new videos and music albums are added regularly. In the public areas of the yacht, there are large-screen TVs so groups can enjoy the latest movies as well, but thats just the start. 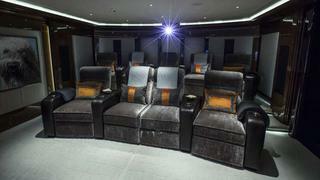 Many yachts have dedicated media rooms, with comfortable seating for the guests. 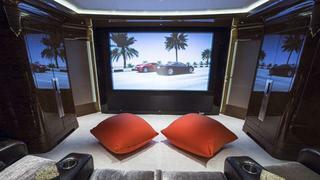 These are like mini-theaters, with huge screens and high-tech, surround-sound systems better than many movie theaters. One attraction that is now appearing on charter yachts is the outdoor cinema, where an upper deck is fitted with a retractable screen so you can enjoy a pleasant evening under the stars while watching a hit movie from comfortable lounges. And, yes, every charter crew is ready with plenty of buttered popcorn to add to your enjoyment, too. If youre worried that youre going to miss an episode of a favorite TV soap opera or series, dont worry. Modern satellite television (sat-tv) systems can stream every possible show right to your stateroom or other TVs aboard. It doesnt even matter that you are far from your home-area programming: Sat-tv will pick up regional and worldwide signals easily. Love to play games? Every charter yacht carries a complete selection of board games and plenty of decks of cards so you can test your skill, often at a dedicated game table in the salon. For those who prefer electronic challenges, charter yachts are well-equipped with computer games such as Playstation and X-Box, and all the televisions are fitted for joysticks and other video controllers. Cruise ships all feature casinos, and so do many charter yachts as well. You can find yachts equipped with everything from blackjack tables to roulette wheels if you fancy an evening with Lady Luck. Want to party? Youve come to the right place. Besides having sound systems on every deck, charter yachts often have areas designed specifically for you to disco the night away. These may be inside or on an open deck, but the lighting rivals the best nightclubs and there is never a line at the fully-stocked bar. 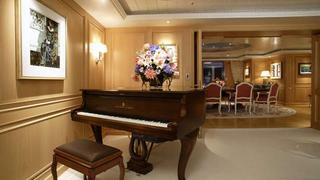 If you are in port, your captain can easily arrange for a live band or a DJ to make your evening special. Prefer something a little more sedate? Many charter yachts are equipped with pianos so you can enjoy a pleasant dinner with your guests to the background sounds of live music. Now, if you were concerned that you might find yourself bored in the evenings aboard a charter yacht, worry not - you should probably worry that you wont have time to try all the wonderful choices.